With the introduction of a bipartisan climate solution in Congress we’ve stepped into the next phase of outreach in the Outdoor Industry Sector. There’s no question that this industry can play a critical role in climate advocacy. The outdoor recreation industry contributes $887 billion annually to the U. S. economy and more than 150 million Americans participate in outdoor activities each year. The Energy Innovation and Carbon Dividend Act of 2019 (H.R. 763) has enabled us to turn support for Climate Action, Carbon Fee and Dividend and the Carbon Pricing Principles into endorsements for the legislation. This approach has led to 33 endorsements for the bill by trade associations, ski resorts and businesses as well as from 21 individuals, including Olympic gold medalists and Alex Honnold, the young man who scaled Yosemite’s El Capitan without ropes or harnesses and was featured in National Geographic’s Free Solo documentary. 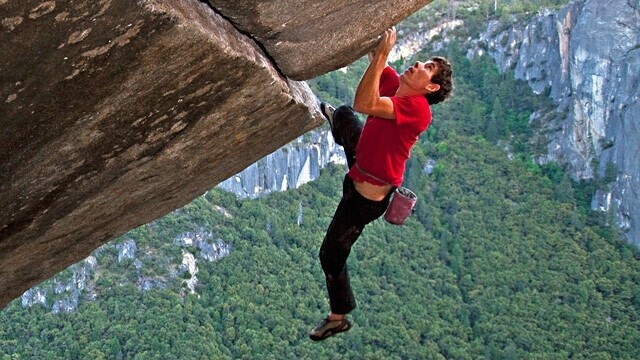 Alex Honnold takes on El Capitan. From the documentary Free Solo ©2018. We track these endorsements and quotes so that they can be used as a resource to secure more support. But there are other opportunities to engage beyond an endorsement. One of those is the upcoming National Ski Area Association’s national convention in late April in San Diego. Citizens’ Climate Lobby Executive Director Mark Reynolds will be a panelist in their Climate Change Solutions session. During the conference, I and my Outdoor Industry Sector co-lead Matt Tucker will staff an information booth provided by the NSAA to field questions and network with those in the industry. Interested in getting involved? Join us on our monthly sector call on the fourth Monday of every month at 5 p.m. Pacific Time (8 p.m. ET). Zoom in at https://citizensclimate.zoom.us/j/653379712 or by phone: +1 408 638 0968 (US Toll) or +1 646 558 8656 (US Toll) Meeting ID: 653 379 712.